Geology Glacial till at souther edge of shallow mire over shales below the Underset Limestone. Record Name Harker Mires. 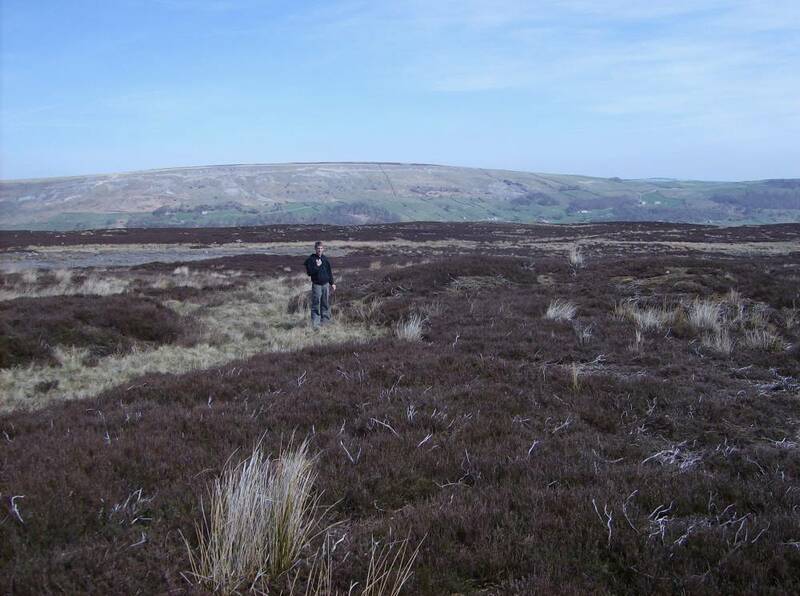 The Main Burnt Mound within the Harker Mires Ring Cairn Complex of Sites. Record Description Very large burnt mound of characteristic form- crescentic on plan, double hump appearance with central hollow which marks the position of the trough. 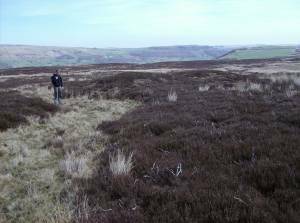 Peat and heather covered located on East bank of stream, 30m below spring rise. Additional Notes *Indicative Dimensions: Size: Small <6m, Medium 6m-9m, Large 10m-15m, Extra large >15m. Height: Low <0.5m, Average 0.5-1.0m, High >1.0m. Burnt mounds are crescentic or circular mounds of fire cracked , reddened sandstone. They vary in size from 4m to 18m diameter and can be more than 2m above present ground level. 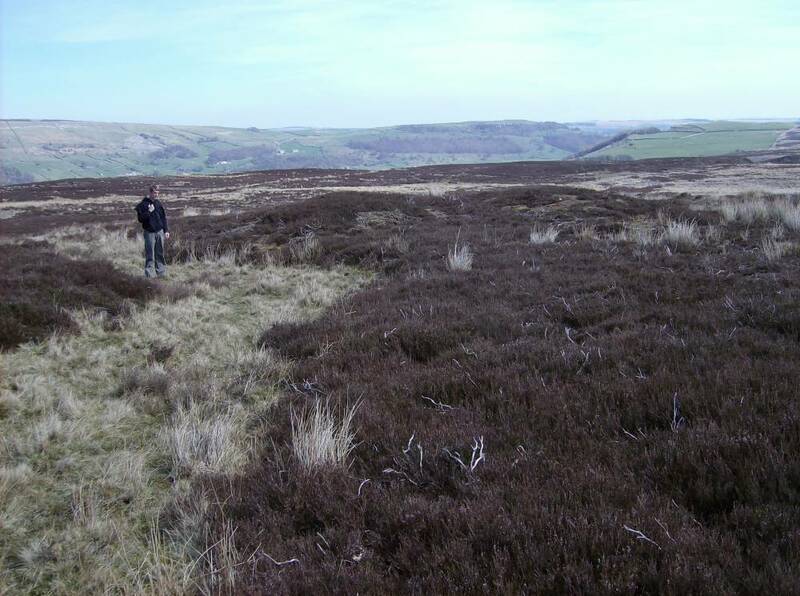 In the Eastern Dales, their regular distribution at springs at 1-2km intervals on the Dale Sides may represent the distribution of contemporary transient settlements with which they were associated. They are numerous throughout Britain and their distribution is not limited to the Uplands. Their use as sweat house saunas seems most probable in the absence of any evidence for cooking. Radiocarbon dates from burnt mounds have been obtained from as early as 2400CalBC to around 800 CalBC, most are of Middle Bronze Age date. 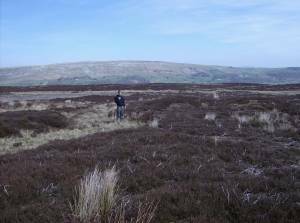 The six burnt mounds at the spring line overlooking Harker Mires of which this is the largest, are an important component in the Bronze Age landscape complex centred on the ring cairn and cairnfield (Grinton 2650) 150m to the North of this site. They may be the earliest evidence for transient seasonal occupation of this well watered elevated terrace. 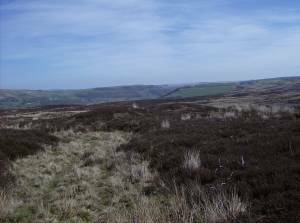 The small low energy stream would have provided ideal habitat for beaver whose silted up dams (Bryony Coles, 2006) may have caused the formation of fertile mesa pastures attractive to fauna and most suitable to pioneering arable settlement- such as the the cairnfield and paddock like fields on Harker Mires. 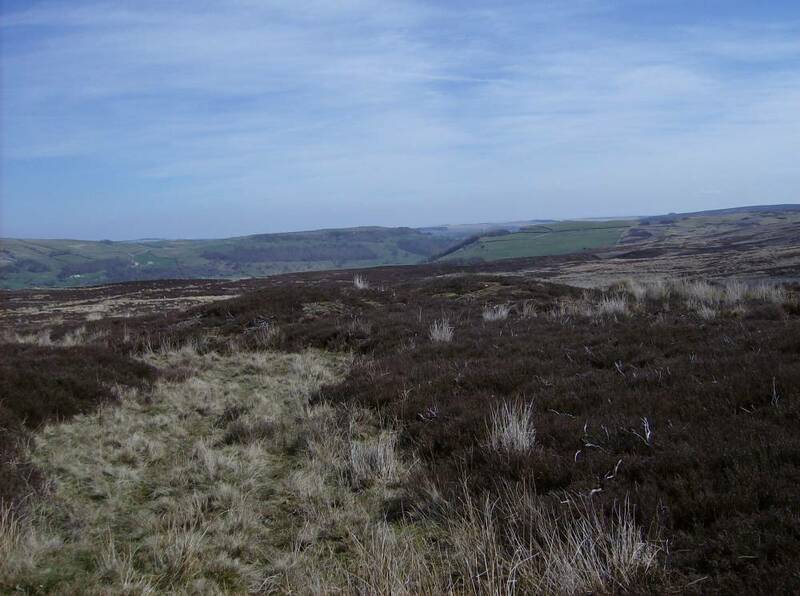 Many burnt mounds throughout the Dales are located at the spring rise of lateral, low energy streams which flow parallel to and across the elevated terrace below the Underset Limestone before turning at right angle to fall abruptly to the floor of the dale below. References Coles, Bryony. 2006. Beavers in Britainï¿½s Past. Oxbow. Laurie,T.C. 2003. 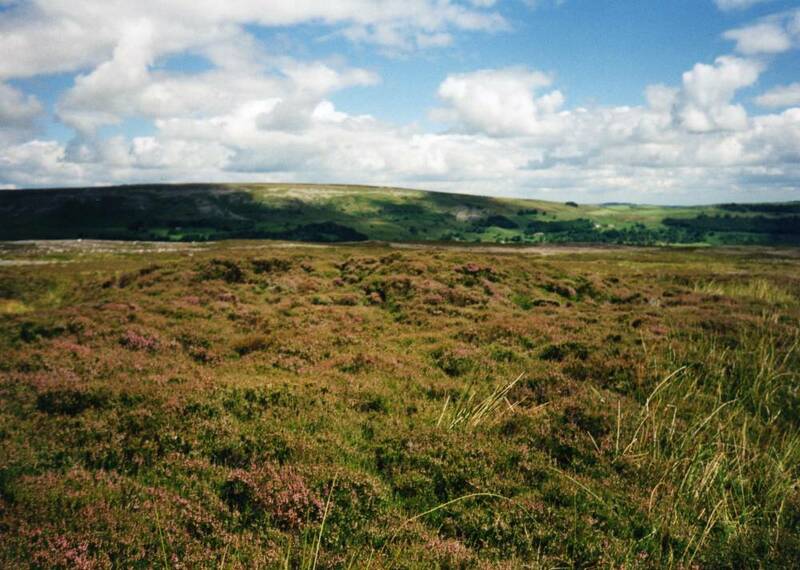 Researching the Prehistory of Wensleydale, Swaledale and Teesdale, in ï¿½The Archaeology of Yorkshire-an assessment at the beginning of the twenty first centuryï¿½. Leeds: Y.A.Soc Occ Pap 3, 223-34. Laurie , T.C. 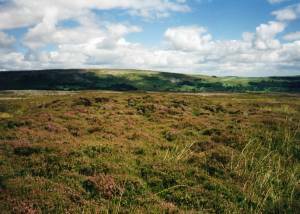 2004. ï¿½Burnt mounds in Wensleydale and Swaledaleï¿½. Leeds: Y.A.Soc Occ Pap 2,79-88. Laurie, T.C 2007. ï¿½ Enigma excavations - The Sturdy Springs Burnt Mounds, October 2006ï¿½. Conservation Update, Defense Estates. 2007. Image 1 Description Harkermires burnt mound under heather. Image 2 Description Harkermires burnt mound next abandoned stream 20m below spring. Image 3 Description Harkermires burnt mound next abandoned stream 20m below spring. Image 4 Description Harkermires burnt mound next abandoned stream 20m below spring.